Resilient Virginia’s Board of Directors has set a path for the organization’s next four years that will focus on a number of resiliency topics deemed priorities at our February “Virginia’s Sustainable Future Meeting.” The organization views these priorities — that include energy and food security, water management and infrastructure adaptation, health and economic stability, and ecosystem valuation — through the lens of rural and urban communities’ interdependencies as they all address a growing range of climate-driven and national security challenges. 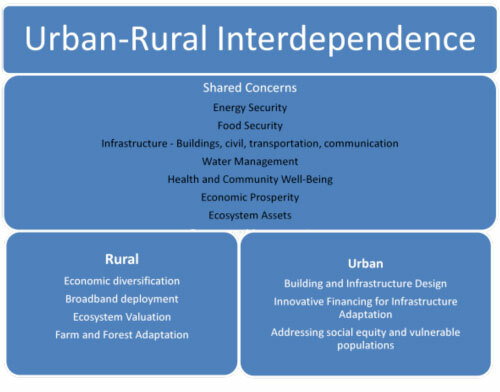 Below is a graphic representation of the shared issues and as well as resiliency topics more focused on the rural or urban areas. For 2018 and beyond: Resilient Virginia is partnering with like-minded organizations to co-host or participate in educational events. This Spring we co-hosted events with the US Green Building Council, Science Museum of Virginia, and Arlington Home Show. In addition, Annette Osso, Resilient Virginia’s Managing Director, participated as the NGO member of the National Capital Region Team invited to the Building Resilient Communities Leadership Academy, a 3-day workshop hosted by the Institute for Sustainable Communities. This summer Resilient Virginia’s Annette Osso will be speaking at the Leaders in Energy’s “Green Leaders for Local Impact Retreat” on June 8 (see article below), and again co-hosting presentations with the USGBC Virginia (see article below). Resilient Virginia will organize an October 2018 Rural Resiliency Roundtable Forum to focus on issues of special importance to rural and agricultural communities. You are invited to participate in the Planning Committee for this event by contacting Annette Osso (osso@resilientvirginia.org). Our next statewide Resilient Virginia Conference will take place in the Spring of 2019. Planning for this event will begin in September 2018. Contact Annette Osso (osso@resilientvirginia.org) to be included on the Planning Committee. You are invited to our July 19th Annual Meeting to hear more details about upcoming Resilient Virginia activities, to meet our Board and Advisory members, and to add your voice on local communities’ and state agencies’ resiliency priorities. We will share more details about this upcoming event in the near future! Becoming a Member or Annual Sponsor. 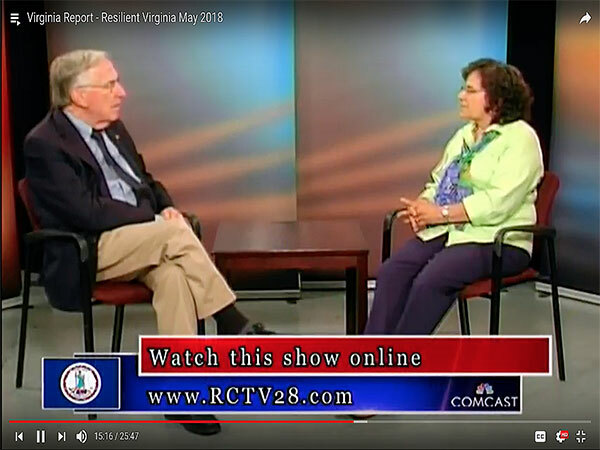 We want to thank State Delegate Ken Plum for inviting Annette Osso, Resilient Virginia’s Managing Director, to provide an informative interview about the past, present, and future of resiliency planning in Virginia. This appeared on his weekly broadcast on the Reston Comcast Channel May 8 and 9. You can view the program here and on the Resilient Virginia YouTube Channel. Our planet and its inhabitants face numerous challenges ranging from people not having enough to eat, threats to biodiversity, growing inequality, and pollution that is changing our planet’s capacity to provide sustainable livelihoods due to climate change. This is a tall order of concerns. Suppose there was an “Innovation Jam” where everyone in the world got together to see what could be done about these issues. In 2015, the United Nations did something along these lines. It conducted a consultation among 5 million people from across 88 countries in all the world’s regions asking for their shared vision for the world in 2030. 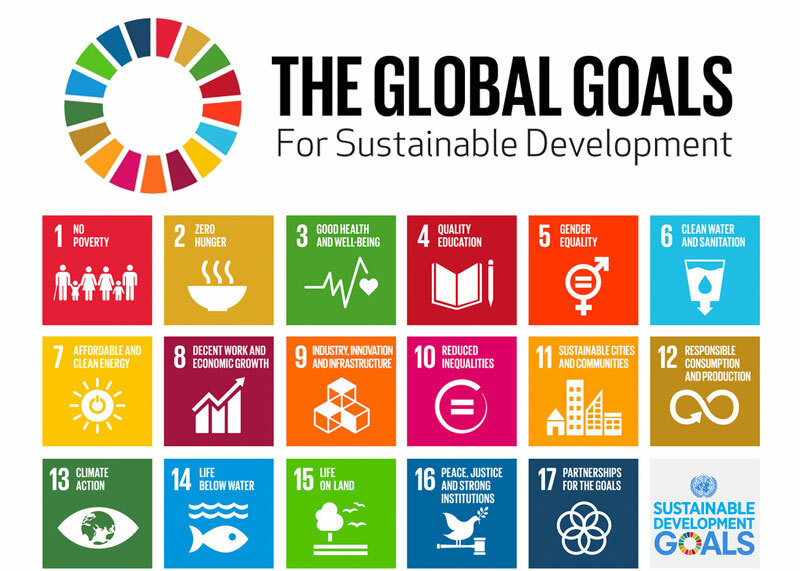 The result is the 17 UN Sustainable Development Goals (SDGs). Three U.S. cities have been at the forefront in working to operationalize these goals into their urban planning programs. These include Baltimore, New York, and San Jose. In addition, a recent report titled “The U.S. Cities Sustainable Development Goals Index 2017: Achieving a Sustainable Urban America” examined progress being made towards sustainable development in the 100 most populous U.S. cities. A fun quiz called “Which Goals Are You?” helps those who are new to the UN SDGs to identify the ones that that most resonate with their own personal interests. Communities in the greater Washington area can also benefit from the SDGs, while also making our world a better place. In that spirit, a “Green Leaders for Local Impact Retreat” will be held in Arlington, VA hosted by Leaders in Energy on June 8th, from 1–5 pm. The retreat will examine several UN SDGs, including #7 on clean energy, to explore actionable solutions to create more sustainable LOCAL communities in the DMV region. Won’t you join us in seeking to make a Green LOCAL impact with local SDGs? The series will share tools and strategies for building practitioners, community leaders and resiliency advocates. In accordance with the 2014 industry statement on resilience released by the U.S. design and construction industry, USGBC recognizes that “natural and manmade hazards pose an increasing threat to the safety of the public and the vitality of our nation.” Addressing issues of community resilience are critical to better preparing and recovering from these hazards. The USGBC Virginia community is partnering with Resilient Virginia to provide education focused on improving the resilience of buildings, infrastructure and communities in the Commonwealth. Preparing for harmful events with sustainable planning and policy can save money and accelerate recovery. Join us for our 2018 Resiliency Education series to learn more about tools and strategies available to building practitioners, community leaders and resiliency advocates. Our first session, held in Roanoke in March, focused on the city’s use of the Envision Rating System for Sustainable Infrastructure. Future events are listed below. USGBC community members and Resilient Virginia members receive a discounted rate to attend. One hour of GBCI CE credit will be offered where applicable. Register for the June session. Read more about the new RELi design standards. Presented by Skip Stiles, Wetlands Watch. Register for the July session. Dates for additional events in Richmond and Northern Virginia will be announced soon. Go Green Virginia is celebrating its 10th year as a pathway to sustainability and energy savings for cities, towns, and counties around the Commonwealth. The program, working with the Virginia Municipal League (VML) and Virginia Association of Counties (VACO), provides a guide to communities and sets up an annual friendly competition known as the Green Government Challenge. The “Challenge” is designed to encourage implementation of specific environmental policies and practical actions that not only reduce carbon emissions and promote sustainability initiatives, but can save local governments money. Resilient Virginia is pleased to have been actively involved on the Advisory Committee over the past three years. In 2016 we were invited to add the newly created “Resiliency Checklist” to the GoGreen Virginia document. 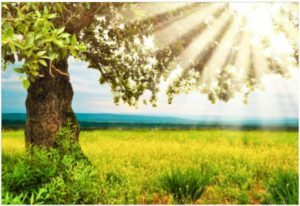 For the 2018 GoGreen Challenge, we are happy to report that resiliency is highlighted in several ways throughout the Challenge. For example, Item One provides points to communities that “Adopt a resolution focused on environmental stewardship, sustainability, or resiliency.” In addition, key resiliency aspects for local government planning and actions are highlighted in the Resiliency Section (Items 85–93). We encourage local governments to weigh in on the Resiliency Section this year, since Virginia communities are facing increasingly more frequent weather and environmental challenges. These include extreme weather events and intermittent drought conditions, and well as the increased occurrence of extreme heat events, periodic flooding, sea level rise, and new health risks. Resilient communities are better able to bounce back from disasters and disruptions in a sustainable way, while maintaining a vibrant quality of life for community members. In the long term, they are better prepared for uncertainties and able to adapt to changing conditions. The Go Green Challenge for local governments opened May 15; check out the details at http://www.gogreenva.org/. Local governments can garner points by taking specific actions and be recognized as certified, silver, gold or platinum green governments. VML Green Government Challenge deadline: September 3, 2018. VACO Green Government Challenge deadline: October 5, 2018. June 8, 1:00–5:00pm: Green Leaders for Local Impact Retreat. Presented by Leaders in Energy Event, Potomac Overlook Regional Park, Arlington, VA. Click here for details. June 12, 12 Noon–1:00pm: Daniel Slone, Vertical Vision, PLC, Shaken, Not Stirred: Community and Building Resilience. Co-hosted by USGBC Virginia and Resilient Virginia, City Space, Charlottesville, VA. Click here for details. July 17, 12 Noon–1:30pm: Skip Stiles, Wetland Watch, Collaborations on Flooding Adaptation, Hampton Roads. Co-hosted by USGBC Virginia and Resilient Virginia, Location TBD. Click here for details. July 19: Resilient Virginia Annual Meeting. Members, supporters, and partners are invited to participate and learn more about the Resilient Virginia new Strategic Plan, network, and add your voice to resiliency planning. Look for more details and registration information coming soon! Check our Resilient Events Calendar on a regular basis to find out what is happening in Virginia, around the nation, and virtually through webinars. Membership — Be Resilient and Stay Cool This Summer — Join Today! Virginia communities to build resiliency in the face of challenges to community prosperity, national security, and changing climate. JOIN TODAY — IT’S OUR FUTURE!